Acacia granitica, the Granite Wattle, comes in two forms. One is a low and spreading shrub with a flat top whilst the other is tall with a rounded growth habit. Both forms have long, narrow, leathery phyllodes with many fine parallel veins. Flower heads are small, ovoid in shape, bright yellow and carried at the base of each phyllode. Flowers appear from early to mid spring. 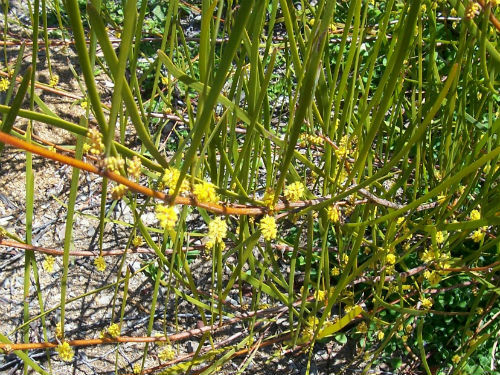 The growth habit, of the low growing form, and the flowers of both forms are attractive features. Prune both forms after flowering. Cut off each branch behind the spent flowers. The species was named in 1921 and was previously known as A. doratoxylon var. ovata. A. granitica is common in northern NSW and southern Queensland. Propagate from seed that should be soaked in boiling water before sowing.